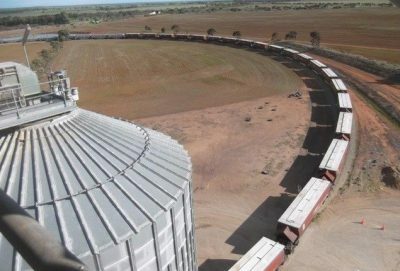 TRADERS are bidding up big at South Australian sites on the national rail network to secure grain for end-users in inland New South Wales, where the drought-reduced harvest is tearing south at a rapid rate. What it shows is that drought remains the major influence over grain prices in Australia, as nuanced yesterday by GrainCorp managing director and CEO, Mark Palmquist, who said Victorian ports might join NSW and Queensland in receiving transhipped grain from Western Australia and South Australia. RainAg cotton and grain market manager, Ian Grellman, said port prices this year should be relatively the lowest, whereas country NSW prices were at relative premiums. “Compared with last year, when plenty of southern NSW grain from the 2017 harvest was trucked to the Darling Downs, this year it will all stay local,” Mr Grellman said. Barley bids have fallen $25 per tonne at SA ports in the past fortnight. Grain marketing team leader with South Australian-based Rural Directions, Chris Heinjus, said barley trading has been on the boil as harvest races across the state. After months of universally expensive and relatively stable prices, harvest has been the catalyst for big shifts in spreads, which have brought the market to life. Daily price moves of $5/t have become commonplace on consecutive days, compared with “normal” market daily price movements which might be 50 cents or $1/t. “The Outer Harbour barley bid price in the first half of November went from $343/t to $318/t, mostly in moves of around $5/t per day. Bids at sites as far west as Kimba on the Upper Eyre Peninsula have reflected the willingness of the trade to buy grain, store it for later outturn, then road freight to a mainline railhead to be loaded onto a train bound for the eastern states. Up-country sites have maintained strength, relative to port values, throughout the SA harvest. Crystal Brook, Gladstone and Snowtown numbers are indicating the importance of site-based pricing in SA this harvest for grain which will service the interior of NSW on rail through 2019. In barley, the malt-feed spread has widened to $60/t which would indicate the strong desire of the malt trade to secure tonnage now the crop is in. “Crops which have made it through to harvest in the eastern states have shown themselves to be of generally very good quality. “While harvest is going through at a very rapid rate, the good news is that barley yields are on expectation, possibly a little higher, and quality, at this stage, is certainly better than expected,” Mr Heinjus said. The wheat/barley spread had extended to around $70/t and Mr Heinjus said traders expected that spread to narrow in coming weeks as the trade sorted out its positions. In WA, Ten Tigers consultant, Chris Tonkin, said WA was not seeing a significant drop in barley prices. F1 and ASW1 had been at parity earlier in the year, and for a while, feed barley prices had approached APW1 levels. “Feed barley values are currently about $18/t below ASW1 in Kwinana, and with a relatively low rate of malting segregation, buyers are still keeping the malt to feed differential around $50/t,” Mr Tonkin said. Lachstock Consulting has this week suggested the rise occurred because harvest pressure pushed WA barley values down to a level low enough to entice demand from the latest Saudi Arabian Government tender. Cottonseed ex-gin MIA has been available at about $470-$475/t November while the structure of the market in northern NSW and southern Queensland continued to reflect slower domestic demand and adequate current crop supply. Mr Grellman and Woodside Commodities broker, Hamish Steele-Park, said the new-crop 2019/20 price was still well above export parity. “I’d say it’s $100/t away,” Mr Steele-Park said. Traders said Cargill’s withdrawal from the cottonseed crush market in the wake of its Narrabri plant closure had taken the heat out of the new-crop cottonseed market, which had dropped from more than $400/t to around $350/t ex gin.